Colorado’s wildfire season is getting underway. As of May 3, there is a fire 100 percent contained near Mile Marker 117 on I-25 between Colorado Springs and Pueblo, and high winds are blowing smoke from Arizona wildfires into Colorado, according to the National Wildfire Coordinating Group. However, UCCS has prepared for potential wildfires by working with the City of Colorado Springs to mitigate wildfire risk on campus, according to Marc Pino, chief of police and executive director of Public Safety. “We’re working with the city to identify certain areas of concern. Most of those are further away from central campus that affect some of our infrastructure like radio towers and things like that that need a little bit of work,” he said. The university has two main plans in place in the event of a wildfire on campus: the continuity of operations and firefighting. “Continuity of operations is primarily where the university would be involved if there is something like a wildfire. It’s ‘how do we maintain business as close to normal as possible?’ And then there’s the firefighting aspect of it and that would be primarily the city of Colorado Springs Fire Department would be the first responders,” said Pino. In the event of an emergency, the university will contact students, staff, and faculty through the emergency text system and online through the university website and social media. The emergency system will automatically call all of the classrooms on campus if an evacuation is necessary. UCCS has faced wildfires in the past. In 2012, the Waldo Canyon Fire erupted in northwest Colorado Springs, just a few miles from Garden of the Gods and UCCS. While it didn’t ultimately reach the university, there was concern that the fire would jump the highway and onto campus. The evacuees and first responders were housed in empty dorms on campus during the fire. “A small smouldering fire occurred off the bluff about five years ago,” said Pino. It was put out quickly and without incident. No wildfire has ever caused damage to campus. Lack of precipitation is a major factor in wildlife risk, according to the National Oceanic and Atmospheric Administration. Facilities Services will water mulch areas to decrease this risk. According to Pino, last year, the city gave the university a matching grant to help pay for fire mitigation. Wildfire risk is mitigated when areas of concern on campus are identified and are cleared of debris to remove flammable material like dead vegetation. “Most of it is clearing dead or dying debris. Also, trees that have branches low to the ground need to be cut back to where if a fire does happen, that it doesn’t burn the leaves and the branches; it burns primarily on the base of the tree, which is less likely to spread a fire to other areas,” said Pino. “Students, staff, and faculty can help to prevent fires on campus and elsewhere by smoking in designated areas and fully extinguishing cigarettes, always parking in parking lots or on roads and by completely extinguishing campfires,” explained Pino. Pino also recommends that students prepare for the event of an emergency by gathering necessities. “Always have a go-kit in your vehicle, water, blankets, things like that, not just for summertime wildland fires but it could also be winter weather and you can be stranded,” he said. Pino recommends that students have their prescriptions, important documents, computers, photos and a plan for what to do with their pets. “If you live in an area that’s at risk of having a wildfire close to it, have those things pre-ready to go so that if you get the notice to evacuate you can put those things in your vehicle and evacuate as quickly as possible,” he said. 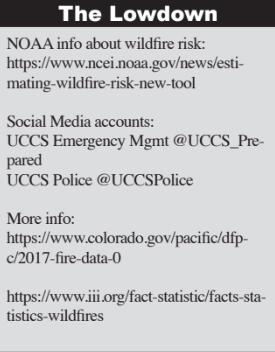 Follow UCCS Emergency Management @UCCS_Prepared on Twitter for wildfire warnings and other emergencies.